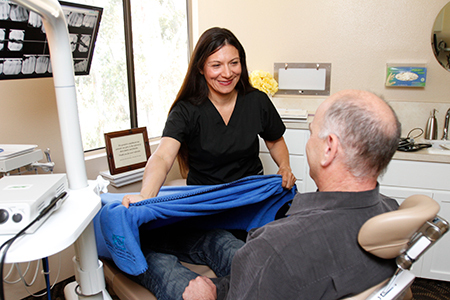 Periodontist, Dental Implants in Mission Viejo, Orange County, CA | Ajay B. Setya, DDS, MSD Robert C. Hirst, DDS, MS Christen S. Bergman, DDS., MS.
Our practice has been serving Mission Viejo and all of south Orange County since 1976, and was the very first periodontal practice in Mission Viejo. As periodontists, Dr. Ajay Setya, Dr. Robert Hirst, and Dr. Christen Bergman are highly trained specialists in all forms of treatment for the gums and bone surrounding your teeth and in the placement of dental implants. 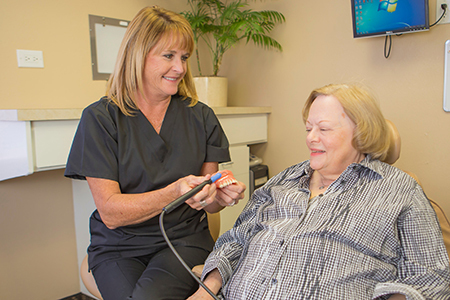 Our doctors spend as much time as is needed showing patients exactly what is going on with their teeth and gums. Dr. Setya has multiple certifications in advanced dental implant procedures, including from the Misch International Implant Institute, Spear Dental Institute and the Pankey Institute—three of the most renowned advanced training centers in the country. He is also a lecturer and trainer to other practitioners across the U.S. and abroad on implant procedures, gum disease treatment and gum recession treatment. Dr. Hirst became a periodontist in 1972 while serving in the U.S. Navy Dental Corps. He has received numerous awards for his competence and served three years as the head of the Periodontics Department at the US Naval Regional Dental Center in Guam. He opened up his practice in 1976 and continues to provide expert gum disease treatment, gum recession treatment and cosmetic gum treatment. Dr. Bergman, a Diplomate of the American Board of Periodontology, is a highly trained periodontist, skilled in all aspects of periodontal and implant dentistry. Her areas of specialty and expertise lie in soft tissue cosmetic surgery and laser periodontal therapy, utilizing the latest biologic materials and technology available in the field. Our doctors deliver the full range of periodontal services, which includes comprehensive gum disease treatment, gum recession treatment, cosmetic gum treatments and full dental implant services. 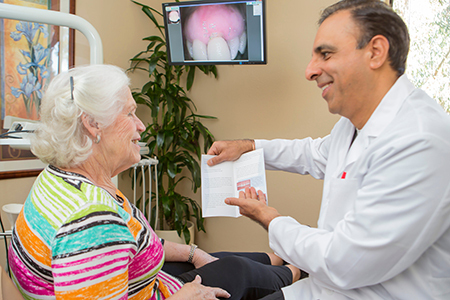 Our doctors are specialists in the diagnosis and treatment of periodontal (gum) disease. They use the latest in advanced technology to provide effective gum disease treatment using gentle and minimally invasive techniques. Micro instrumentation and dental lasers are used to make procedures more comfortable and effective. Our 3D cone beam CT scanner is used in planning your dental implant placement. 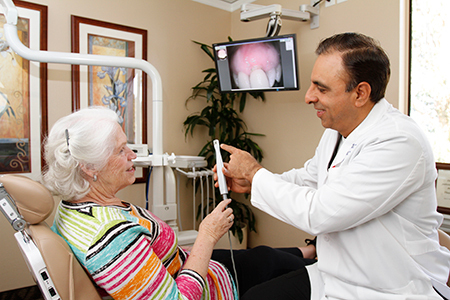 Dr. Setya uses advanced technology to plan your implant treatment. 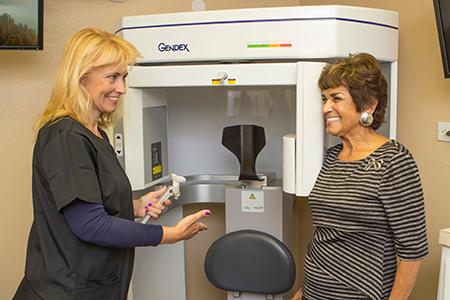 He uses a state-of-the-art cone beam CT scanner to provide 3D images in 360º view of your teeth and jaw area. This means he can plan the implant surgery ahead of time, making your surgery efficient. In addition to placing your dental implants, Dr. Setya works closely with top restorative dentists to create the high-quality crowns, bridges and dentures that attach to them. For patients with gum recession, we perform minimally invasive gum grafting procedures and restore your natural gum line. A restored gum line not only enhances the beauty of your smile, it preserves the health of your teeth by protecting them from damage and decay. 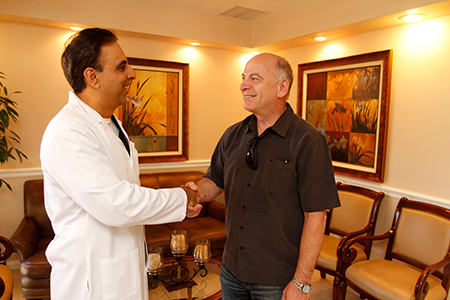 Our doctors use micro-surgical instrumentation and advanced gum grafting procedures. This makes the treatment much more comfortable and healing time much faster than with traditional methods. Dr. Setya is certified in the Chao Pinhole® Surgical Technique. This technique doesn’t require cutting, suturing, or removing healthy gum tissue from another area of your mouth. It can be performed in one to two hours, and has a faster recovery time. Our staff make sure you are comfortable and cared for at all times. Our staff are very friendly and will take care of your every need from the time you walk in our doors. They will work closely with you to make sure your appointments are efficient and that you are comfortable at all times. Our doctors are very interested in you and your concerns and will always listen to what you have to say. They will thoroughly explain what will be happening with your treatment and will always answer any of your questions so you are well informed and can feel at ease.